The Radiological and Nuclear Regulatory Authority of Paraguay and Russian state nuclear corporation Rosatom yesterday signed a memorandum of understanding on cooperation in peaceful uses of nuclear energy. The document was signed by Eladio Loizaga, Paraguay's minister of foreign affairs, and Nikolay Spassky, Rosatom's deputy director-general. 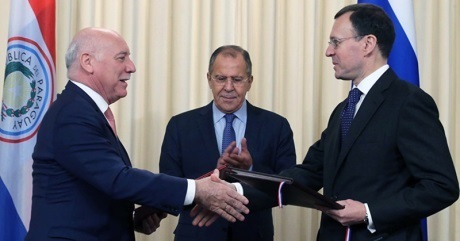 The signing ceremony was attended by Russian Minister of Foreign Affairs Sergey Lavrov. In a statement, Rosatom said the memorandum - which is the first document related to the peaceful uses of nuclear energy to be signed between the two countries - constitutes the basis for bilateral cooperation in a number of areas including: the application of radioisotopes and radiation technology in industry, medicine and agriculture; assistance in creation and development of a nuclear power infrastructure in Paraguay; nuclear and radiation safety and security; and, development of programs aimed at raising public awareness about nuclear technologies and their applications, including organization of information centres. The two sides have agreed to consider joint work on projects such as construction of a nuclear science and technology centre with a research reactor. They will also consider the possible development and signing of an inter-governmental agreement on cooperation in the peaceful uses of nuclear energy, Rosatom said. Paraguay is not known to have any nuclear power ambitions, but it has some uranium. In May 2015 Texas-based Uranium Energy Corporation was granted regulatory approval to advance its Yuty in-situ leach uranium project in southeast Paraguay from the exploration phase to justifying its mining potential. The Yuty project has NI 43-101 compliant measured and indicated resources of 3430 tU at an average grade of 0.052%, with an inferred resource of 856 tU at an average grade of 0.047%. The deposit - some 200 km southeast of Asuncion - is located within the Parana Basin, which is host to a number of known uranium resources, including Figueira and Amorinopolis in Brazil. UEC also has the Oviedi project in Paraguay.